Since its early days as mere vandalism on the walls of subway trains to the more elaborate and professional-looking pieces that adorn the walls of cities in the 21st century, graffiti art has become an expressive, if controversial, part of culture. While some people view graffiti as a scourge to urban environments, modern graffiti has become more accepted — and sometimes even legalized by city authorities — thanks to a number of advantages that have emerged. The problem with art in the 21st century is the notion that it’s sometimes just not seen, thanks to a lack of interest from people, especially the younger generation. These people don’t go to museums and art exhibitions, and so aren’t generally exposed to works of art. Well-worked graffiti helps to redress this problem by bringing art directly to the public, pushing it in their faces, and perhaps helping to foster an interest in artwork that will drive individuals to explore the art world further. Graffiti gives individuals the freedom to express themselves in a way that they wouldn’t have had otherwise. For some, this freedom comes from the accessibility of graffiti; all this medium needs is a spray can and an idea, and the artist can create what he wants, as opposed to having to purchase expensive supplies to get started. For other graffiti artists, the advantage of the medium is that they can express an opinion or idea, such as a political point, and get it seen, in a bid to be heard and perhaps create an impact. Well-worked graffiti art is typically creative, colorful and bold, and thus it changes the character of the particular area where it appears. In many cases, this change is positive, since the art turns drab and monotone buildings and bare walls into interesting and eye-catching exhibitions of the imagination. Neighborhoods are brightened up without local authorities needing to engage in refurbishment programs. A lot of high-quality graffiti contained within a particular area can raise that neighborhood’s profile significantly as an arts scene. In time, other artists flock there, and the cultural value of the area is increased. This can in the long-term aid the local economy, as tourists head to the area to look at the graffiti, and local-run tours pop up to show visitors around. Art is often taught to youngsters as part of their education, but not everyone takes to it. For some, the problem lies in the medium; an individual might not enjoy traditional forms, such as painting and sculpture for instance, while others fail to find art relevant within their lives. 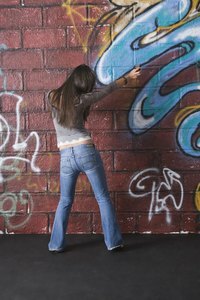 When graffiti is taught as an alternative medium of artwork, it may inspire these individuals, being more rooted in 21st century life than traditional art forms.